One of, if not the most, powerful international issue lobby is that of the pro-Israel crowd. 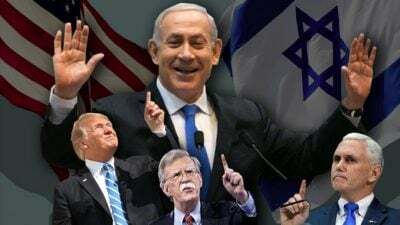 Well-financed and politically powerful, the pro-Israel lobby is a major force on American foreign affairs that looks to continue America’s military and fiscal support of the Jewish nation-state. The lobby has had recent policy success with the Trump administration moving the U.S. embassy in Israel from the internationally-recognized capital of Tel Aviv to Jerusalem, a move long advocated by some in the pro-Israel lobby. Notably however, JStreet, one of the larger pro-Israel groups opposed the move. The administration is very friendly with the Israeli Prime Minister Benjamin Netanyahu and has taken a hard line on Israel peace talks, barely talking to the Palestinians and ending all foreign aid to the West Bank and Gaza. Even with the policy victories coming under a Republican president, the lobby still remained staunch Democratic contributors, giving more than $14.8 million in the 2018 midterms to mostly Democrats. This marked their third-biggest cycle ever and their biggest non-presidential cycle. The largest group which contributed was JStreetPAC which gave more than $4 million to candidates in 2018. Only one other pro-Israel group spent over $1 million on the cycle – NorPAC with more than $1.1 million. The top recipient of pro-Israel funds in the 2018 midterms was Sen. Robert Menendez (D-N.J.) with $546,507. Menendez is the ranking member on the Senate Foreign Affairs Committee. Sen. Ted Cruz (R-Texas) received the second-most with $349,437. 2018 was an all-time high for money spent on lobbying for pro-Israel issues with more than $5 million. The robust lobbying force was led by the face of the pro-Israel movement the American Israel Public Affairs Committee (AIPAC). AIPAC spent more than $3.5 million on lobbying in 2018, making up the vast majority the entire lobby spent. A distant second was the Israeli-American Coalition for Action which dropped $550,000. The pro-Israel lobby is not entirely unified on policy decisions. 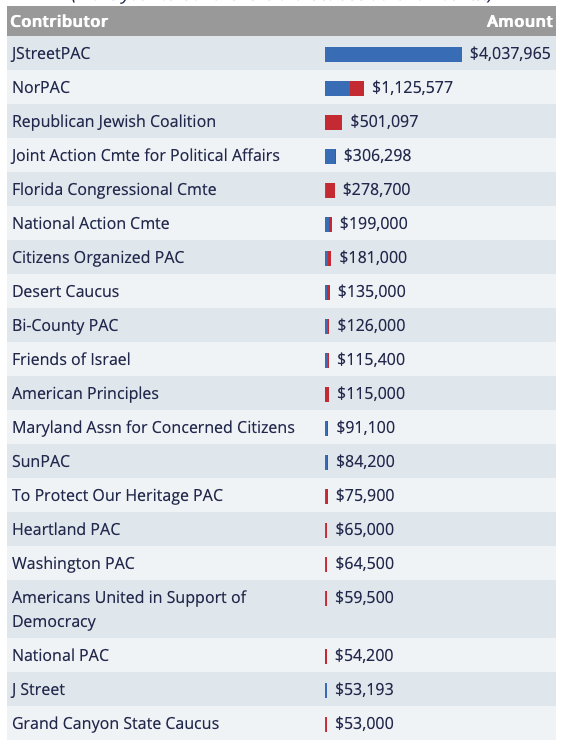 JStreet, the group with the biggest campaign contributions, differs from AIPAC which led the lobbying effort. JStreet is a more liberal organization and is often critical of the Netanyahu and Trump administrations. AIPAC on the other hand has a policy of not publicly criticizing the Israeli government and has been more supportive of Trump. All lobbying expenditures on this page come from the Senate Office of Public Records. Data for the most recent year was downloaded on January 24, 2019.